Bacon Brie Basil Mini Pizzas - Perfect for Fancy Game Day! 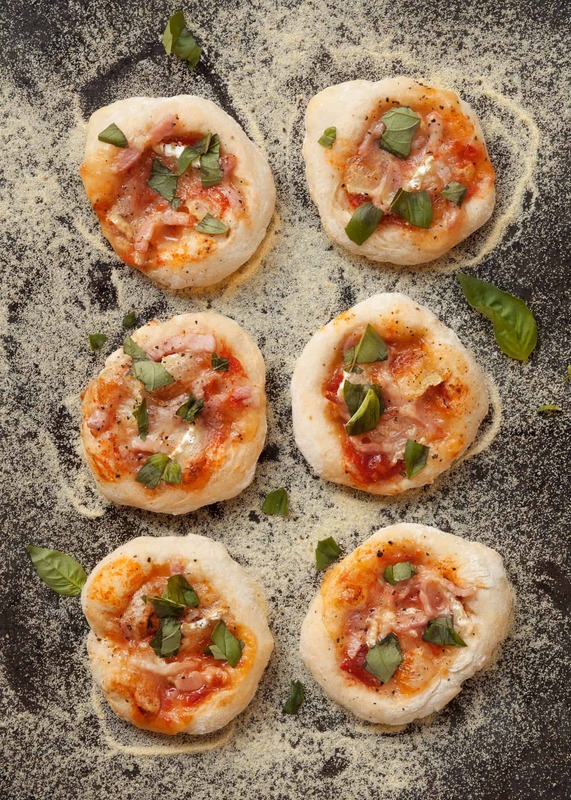 Home » Bacon Brie Basil Mini Pizzas – Perfect for Fancy Game Day! Bacon Brie Basil Mini Pizzas are a delicious full flavor snack perfect for a fancy Game Day party! Hi everyone. I’m Jane from Little Sugar Snaps and I’m thrilled to be guest posting here on Take Two Tapas today with these Bacon Brie Basil Mini Pizzas. You can usually find me dreaming up sweet treats, but when it comes to snacks perfect for munching with a bunch of friends, a sports event on the TV and a few drinks to hand, only savory will do. And since Jennifer excels at creating such snacks I decided to add to her list and share these Bacon Brie Mini Pizzas. 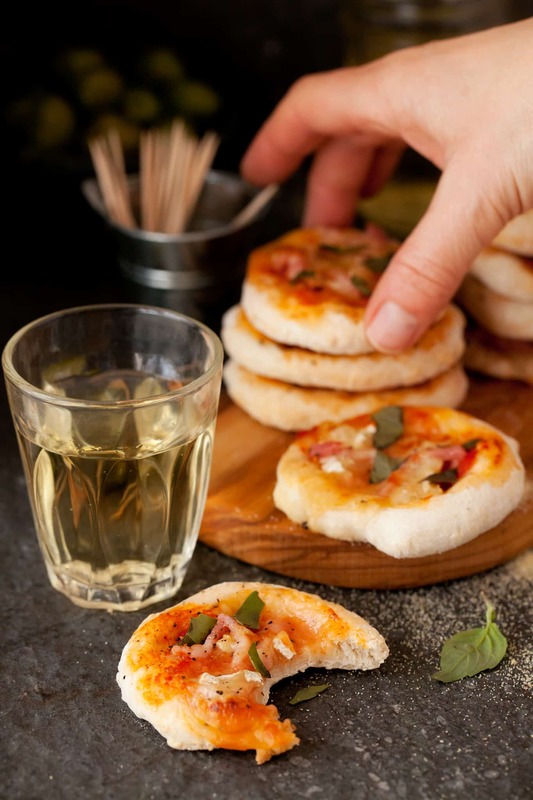 If you’re planning a get together for the next Big Game, March Madness, or (thinking ahead) the World Cup, these Bacon Brie Basil Mini Pizzas will go down a storm. Of course, if like me and you are from the UK, you might find these pizzas handy for just about any Saturday afternoon between the months of August and May when football (Soccer) seems to take over the TV. 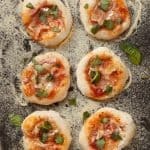 These Bacon Brie Mini Pizzas are simple to make and can even be made in advance ready for reheating just before serving. I’ve used my go-to classic pizza base here – a recipe I’ve been using for nearly a decade. To it, I’ve added a simple tomato base, brie, bacon, black pepper and a scattering of fresh basil once the pizzas are out of the oven. None of these toppings require pre-cooking so these pizzas really are a breeze to make. Oh, and since these Bacon Brie Basil Mini Pizzas are small they can be held easily in one hand – no chance of the pizza bending and spilling the delicious toppings. That, of course, leaves your other hand free for shaking hands with friends, waving flags in support of your sporting team or um… holding your beer. Yeah, I thought that might clinch the deal. Bacon Brie Basil Mini Pizzas and other Perfect Game Day Treats! Other game day snacks you can hold in one hand are Jennifer’s Bacon & Manchego Croquette’s, her Steakhouse Tater Tots with homemade Jalapeno Ranch Dip, or add even more heat to your party with a Mexican Cheeseball with Spicy Tortilla Chips. Serve up a selection of Jen’s snacks along with these mini pizzas and you’ll have some happy houseguests on your hands. Bacon Brie Basil Mini Pizzas. Bacon Brie Basil Mini Pizzas are a delicious full flavor snack perfect for a fancy Game Day celebration! They pair well with chips and beer too! Weigh the flour, yeast & salt into a medium mixing bowl. Add ¾ of the water and turn the mixture with your fingers, adding a little more water as necessary until all of the flour from the side of the bowl has been picked up. Aim for a dough that is soft but not sticky and wet. Tip onto a lightly floured work surface and knead for 5 minutes until smooth and elastic. Divide into 12 equal size balls and place on a lightly floured baking sheet. Dust lightly with flour, cover with a tea towel and leave to rise until doubled in size (around 1 hour, assuming the room is not excessively cold or hot). Put the tinned tomatoes in a bowl with the oil and salt. Use your fingers to squash the tomatoes and break them into smaller pieces. Dust 2 baking sheets lightly with polenta (to stop the pizza sticking). Chop the bacon into thin strips and slice the brie into small chunks. Lightly flour a work surface and roll out the pizza balls to circles approx. 3 inches (7 ½ cm) in diameter (you can stretch the dough with your hands if you prefer). Place dough rounds on a baking sheet. Put a teaspoon of tomato sauce into the center of each pizza and roughly spread out. Divide the brie and bacon between the pizzas, grind a little black pepper over each one. Bake for approx. 5 minutes until the bacon is cooked, the pizza dough is crisp, and the cheese is melted to your liking. Remove the pizzas from the oven and let cool for 2 minutes. If serving immediately, tear up the basil leaves and scatter over the pizzas. Alternatively, let cool and store in the fridge until ready to eat. Reheat in a hot oven for 3 minutes then scatter the basil on before serving. *Streaky bacon is the nearest equivalent to regular American bacon that is available in the UK. It tends to have a slightly higher meat content than typical American bacon, but either will work fine for this recipe. 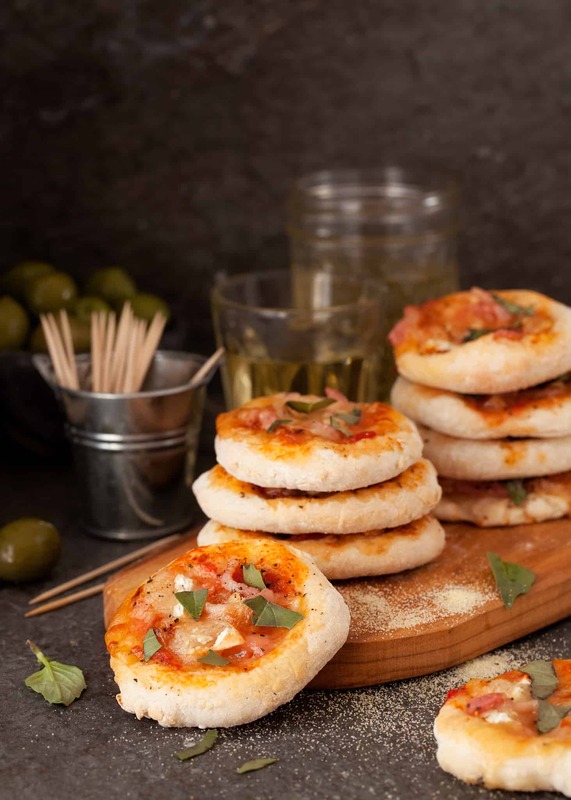 *These Mini pizzas can be served warm or cold and as leftovers in your lunch box. I love these! 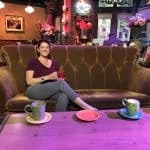 Bacon and brie? Yes please! 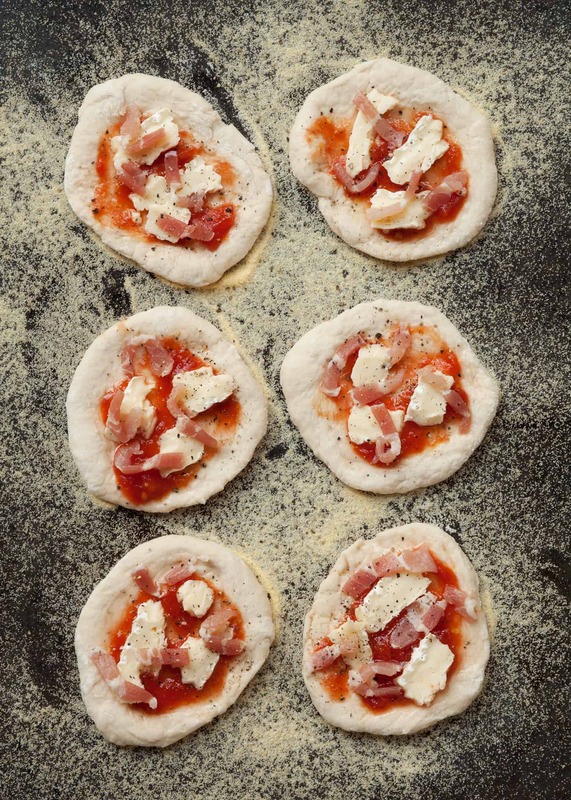 If I have a game day party, these mini pizzas are definitely on the menu!